You are currently browsing the tag archive for the ‘pose’ tag. Well the daffodils are out, the clocks have gone back…it must be spring!! Another part of spring is Mothers Day. 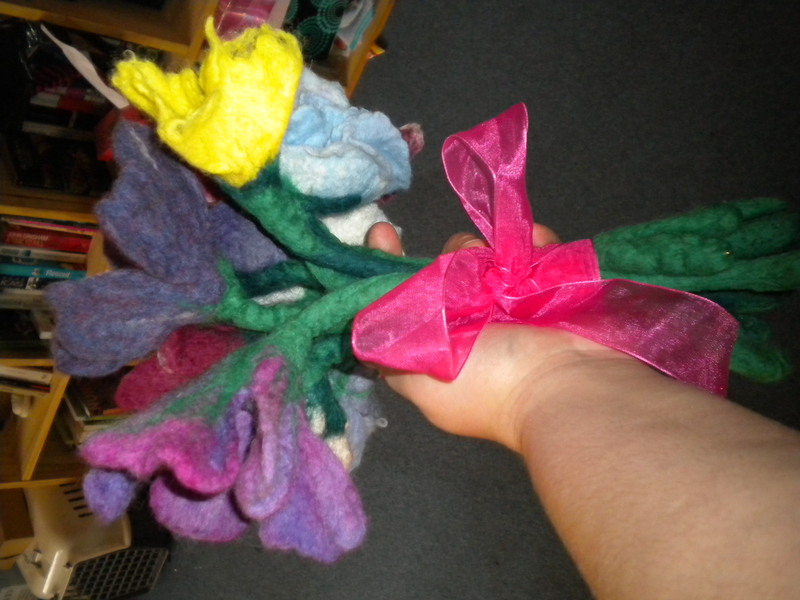 This year I made her a bouquet of poseable felted flowers and a needle felted sheep. 1. The stems were all created by making a cord/rope around some relatively tough craft wire which I have from my jewellery making. To be honest this was very tricky. I was able to make a nice tight rope and leave one ‘brush’ end dry (to attach the stem to the flower) but the other end suffered because, despite being ‘folded’ so not pointy or sharp it kept poking through the non brush end and slipping down. I remedied this by needle felting when dry but it’s a technique I need to perfect. i) Shaped single layer pieces of felt, some of which had we felted balls needle felted to the centre. 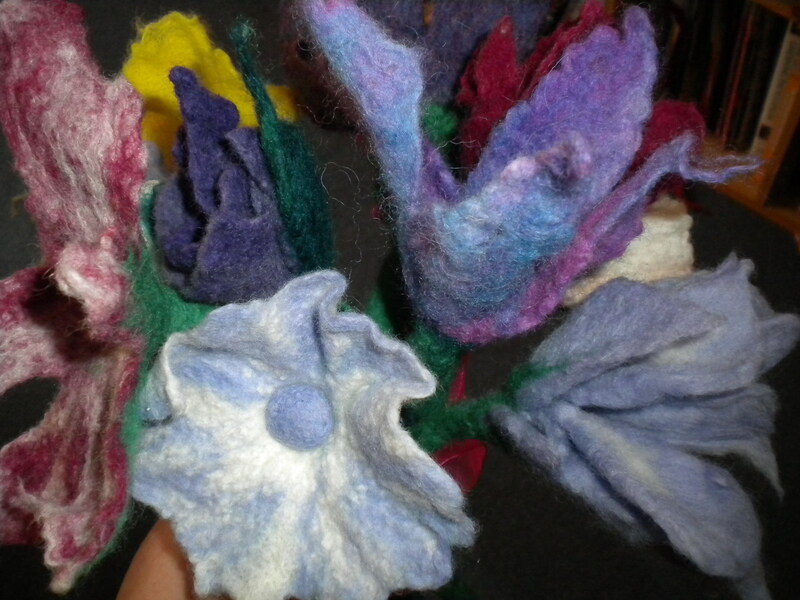 ii) Individually felted petals all with dry brush ends. 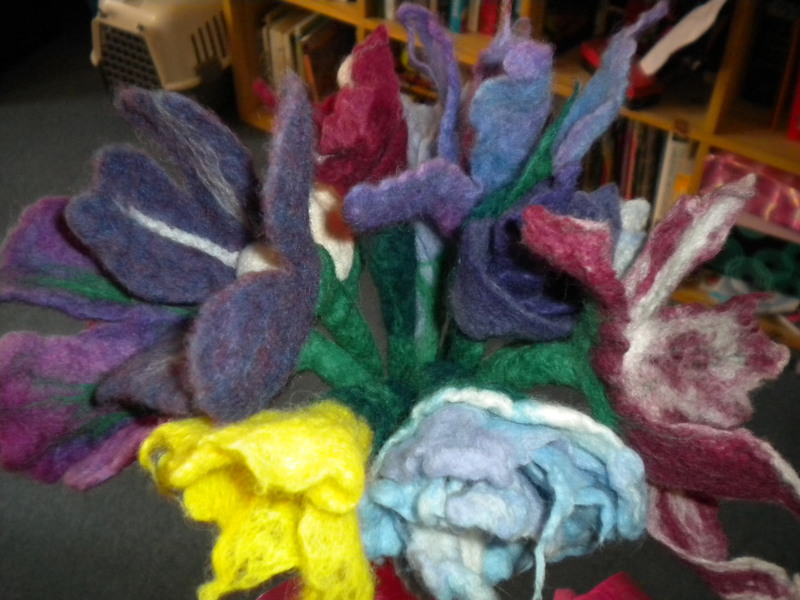 These ends then felted together and into the brush end of the stem. iii) Multiple layers of shaped (ie rounded etc) felt needle felted together (with or without wet felted ball attached with felting needle to the centre). 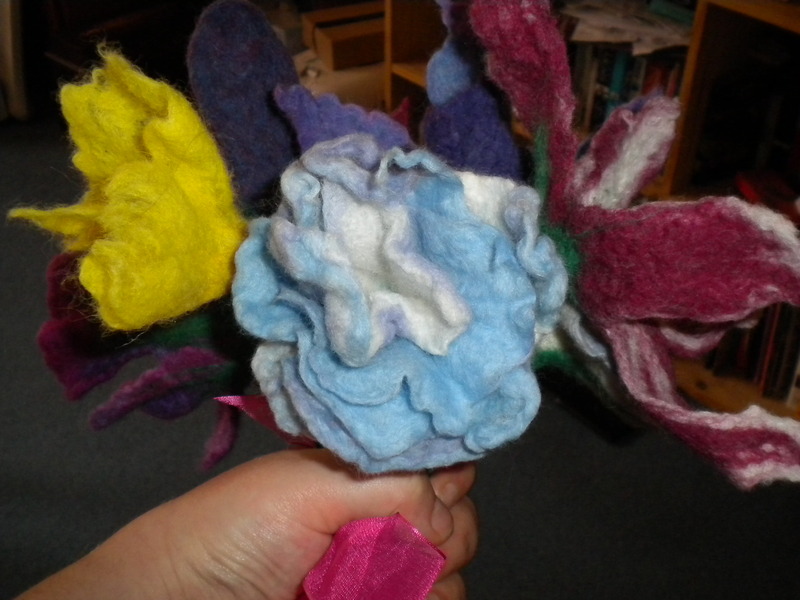 All the flowers were attached to stems by wet felting the brush end onto the flower. 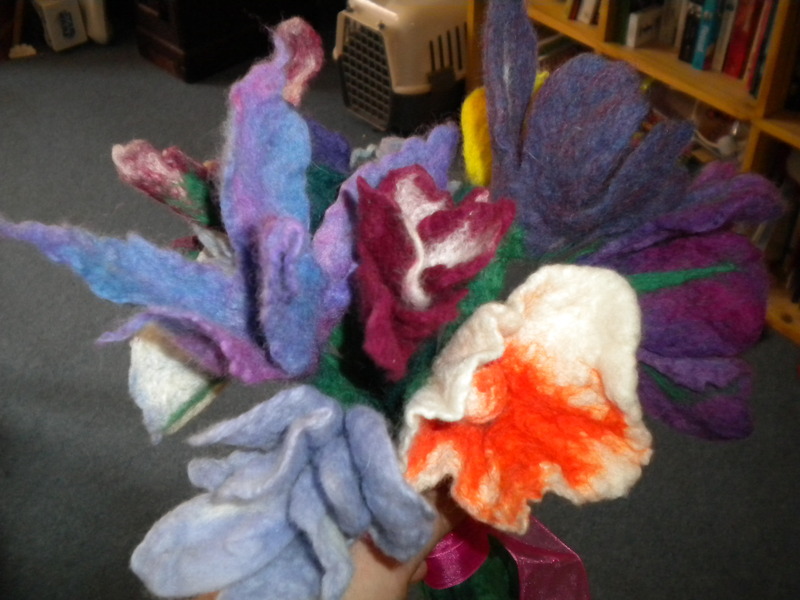 The flowers were laid face down onto my work space, and I held the stem vertically over the centre with one hand whilst felting and fulling with the other. When it was sufficiently well held together I gently turned the whole thing the right way up and rolled between my hands as I would for a cord near the end stages. This was an excellent experiment to do! I’m very pleased that I’ve managed to make a technique I conjured up myself (clever me 😉 ) work this well. I would like to try using pipe cleaners instead of craft wire for the stems but they seem to be hard to find! I’m hoping this will help prevent the wool from slipping over the wire and allowing it to slip out of the supposedly enclosed end. They do stand up on their own, despite being quite long. Yay! As well as being able to bend the stems, the petals are also poseable to a degree, so you can make the flowers look more or less open. The opportunity to experiment so widely and freely with flower design and techniques was fanastic, I’ve loved making them since I started making felt and I’ve learnt some new techniques and tips for them. I realise that it can often be difficult to understand written explanations unless you’re aware of the feltmaking processes so I will try my very best to photograph my projects as I go from step to step for anyone reading.